Artificial Intelligence: Is Your Business Ready? Artificial intelligence is going to find its way into your daily life. Will you be a player in this game or a mere spectator? In June 2017, the McKinsey Global Institute (MGI) published "Artificial Intelligence: The Next Digital Frontier?" 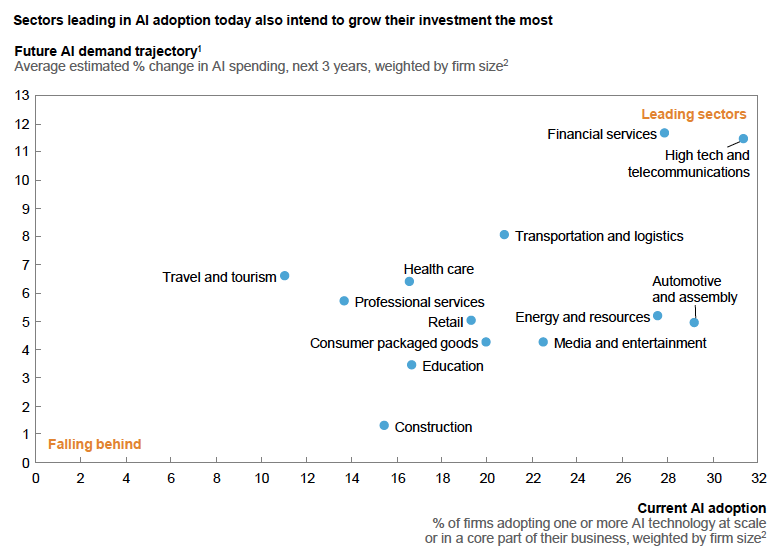 which focused on the continued growth on artificial intelligence (AI), asking the question if AI will be the next wave of digital disruption. Below are some core findings I wanted to bring forth in this article — asking the question if you/your business is ready for the impact AI will eventually present. Before getting started, I wanted to provide a brief history of AI. The concept of AI, from a computer perspective, dates back to the 1950s when the first conference was held on the subject at Dartmouth College. Alan Turing suggested the idea of a non-human being able to communicate with a human to such a degree that the human does not realize they are communicating with a non-human being. This test has since become known as the Turing test. From the 1950s through the 1970s, research and development continued at notable institutions Princeton, Carnegie Mellon, and MIT before funding eventually dried up. After a brief emergence in the 1980s, AI became idle again until the twenty-first century — when computing power and more robust data provided a solid foundation to build upon. The MGI report indicated that the investment in AI continues to expand, with technology leaders Google and Baidu allocating between $20-30 billion in 2016 for AI research and development. In the private sector, the AI investment for 2016 ranged between $4-5 billion. These investments represent three times the investments made in AI just four years ago. The expectation is for this trend to continue in a positive fashion as more firms enter the ripe market of discovery. A majority of the investment was allocated toward the concept of machine learning, which has been highly accepted in the telecom, automotive, and financial services industries. Telecom has leveraged AI in order to gain an understanding of the customer by analyzing key aspects provided by the user — either automatically (detecting a caller’s phone number or through the specific number called) or by navigated prompts provided by the telecom system. In the automotive segment, the use of AI has been heavily implemented at the assembly level with robotics and at a practical level with self-driving vehicles. AI has found a heavy implementation in the financial services industry by pulling various metrics into the credit scoring process. How Can Your Business Get Into the Game? 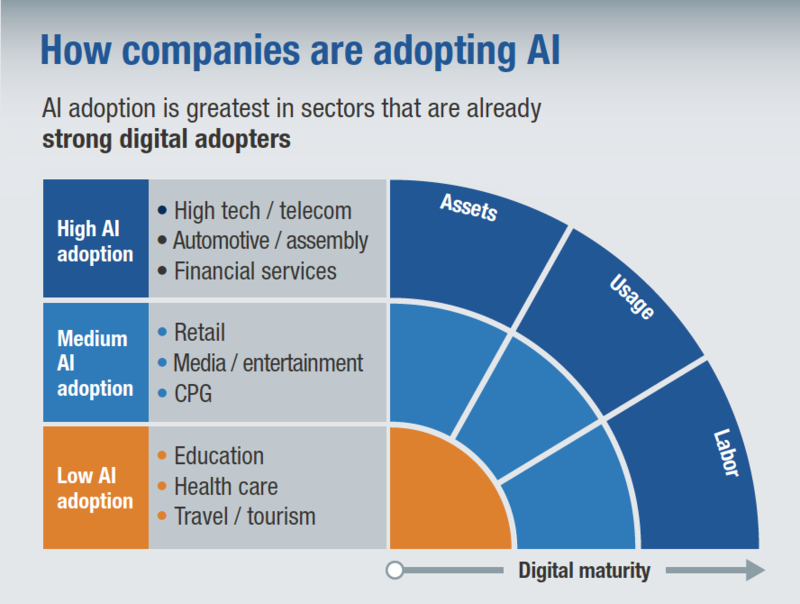 MGI concluded that there is a direct correlation between the level of AI adoption when compared to the level of digital adaptation. Currently, this means that the education, healthcare, and travel industries are lagging behind in the adoption of AI. Education could implement AI to help guide students down the best education path based on their skills, interests, and abilities. Healthcare should consider leveraging the vast amount of data maintained by patients to understand how prevention therapies could be initiated. Travel could match the travel patterns of clientele against popular and discounted destinations to guide consumers to best utilize their leisure budget expenditures. Regardless of where your industry lies along the adoption model, one this is certain: Over time, AI will find a way into your daily life. It is up to you if you are a player in this game or a spectator. As MGI noted, AI will be the next wave of digital disruption. The MGI report is free to download and doesn't even require an opt-in page or email address. As an IT professional, it is worth your time to read, even if you currently believe the impact AI will have on you or your business is minor. You might actually be surprised.